"If you go and see the Rolling Stones you'll book a ticket - and if you can't go then you'll try your best to sell it to someone else." Restaurateurs are trying to figure out how to deal with the issue that plagues their industry - no shows. One celebrated eatery, the Michelin starred Ynyshir in Powys, now charges diners the full meal price up-front - and it could be up to £140 a head. "You've got to be bold," said front-of-house boss Amelia Eriksson. "If you say 'this is our policy, either like it or don't come' then people know exactly where they stand. Are online bookings killing restaurants? "I think people would book a table off the cuff because they thought the restaurant might be full and then decided to go somewhere else but not tell us. "If you think of it from the point of view of a big chain restaurant in a city, they are likely to refill a table if people don't turn up. "I think a lot of people don't take up their bookings and think 'oh someone else will have it' and were applying that logic to us." Ynyshir's rural location near Machynlleth means it doesn't have the luxury of passing trade, so the management decided to take action. 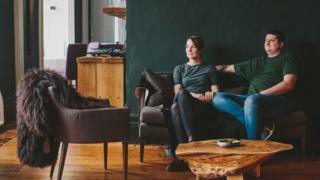 The restaurant, run by chef and owner Gareth Ward and partner Amelia, is one of seven Welsh restaurants to hold a Michelin star. Image caption Andrew Sheridan says people "expect they can turn up when they want and if they don't, it has no impact whatsoever." A 19-course dinner there would cost £140 a head but anyone wishing to eat there now has to pay the total price upfront. "We didn't use to take any detail when people booked so no-shows used to happen a lot," she added. "At first we started taking card details, but that didn't work because people would cancel their cards, then we started taking a small deposit but exactly the same thing happened. "So now we take a full pre-payment so if you commit to coming you will come or let us know." Perhaps unsurprisingly, the problem of no-shows has been eradicated at Ynyshir. In Australia, some chains have started blacklisting people who don't turn up. After three 'offences' they're banned from every outlet. One Scottish restaurant decided to charge cancellation fees after hundreds of people failed to show in a single month. But he is reluctant to ask everyone for deposits, because of the ease with which customers can take to social media. "In the world of Facebook, Twitter, Instagram and TripAdvisor, everyone's a food critic and it's hard on the restaurant trade," said Andrew. "I can't go into the Post Office and write a review saying the lady behind the counter was too slow at giving me the stamps but people can come into my restaurant and slate the whole experience. "Then people hit back and say 'I can't believe you treat your customers like that'. Well hold on, I can't believe you treat the establishments like that. "We employ people which is good for the local area, and we're passionate about what we do, but restaurants are supposed to make money. "It's people's livelihoods and they need the bookings to pay the bills." A table of four not showing up could cost the team £400. If a table for 20 is booked, and only half the guests turn up, the costs get even greater. "People just don't think they have to tell anyone when they're not going to come for a meal," he said. "But we will have brought in staff and ingredients based on the bookings we have." Should people pay for not turning up to a restaurant? Keeping crowdsourcing honest: can we trust the reviews? Video Why are high street restaurants in trouble?